Welcome to the Close To My Heart Summer '09 "Blog Hop!" What's a blog hop? Over 40 CTMH Consultants are celebrating the May 1 release of the Summer 2009 Idea Book by sharing artwork made with something new. If you've found my blog by hopping from another one, glad you're playing along! For my faithful followers, thanks for stopping by yet again. Please leave me a comment to let me know what you think of the blog hop and my project. I hope you enjoy this post and the hop. Just click on the link at the end of the post to go to the next blog. Here we go! My project is a dry erase/memo board that goes into an 8"x10" frame. That's right, just slip this into a frame, and you can write on the glass with a dry erase marker! It will wipe off with a paper towel or my favorite, an old (clean!) sock. I used the new Bella paper pack (in Creme Brulee, Olive, Smokey Plum, and Hollyhock) and the office-ready new My Acrylix stamp set, Comments (D1359). I had to use a Just Blooms flower or two, fastened on with a brad. I didn't want to add too much bulk due to the frame, but I couldn't resist a little. Isn't the paper clip adorable? It is actually stamped on there and is one of the 12 stamps in the set. I even stamped all the writing/journaling lines you see on the memo board. Now, it's your turn to play. Hop on over to Dawn's blog at www.stamptildawn.blogspot.com to see what she has in store. (If you're jumping into the hop here in the middle, you can go back to the beginning at Erin's blog. BTW, give Erin a "thank you" shout out for organizing this fun event.) Hope you can check out everyone's blogs to see some great new CTMH products from the Summer '09 Idea Book. It goes "live" May 1, so check my CTMH website then to see the idea book/catalog for yourself. Happy blog hopping! My online friend Sarah (that sounds a whole lot better than my virtual friend, doesn't it? LOL) is having a great blog candy contest on her blog. Go check it out and you may just win an incredibly awesome prize!!! Getting (and staying) organized is a challenge of mine. In certain situtations, I am organized to a fault, but in others... Sigh. Here however is a great organizing trick that is really working well for my family. I parked this 3-shelf cart by our front door (how I wish I had a true foyer!) and then got a Longaberger small rectangle storage basket for each family member (on the bottom two shelves). I used some manilla tags to label each one w/our names. DH has even gotten into the habit of checking his basket occasionally! This is huge because he used to think that our mantel was his personal depository. Yuck. On the top shelf, I have two catch-alls. The larger one on the left is my medium market basket for my coupon notebook (more on that later!) and anything else outgoing (library books, etc.). I can take the whole basket w/me- or just some of the contents- as I head out the door. The small basket (in the middle) is a retired Mother's Day basket from years past, and it is a beautiful catchall for anything small. My last handy-dandy tip is my small hanging wall basket that hangs on the backside of our front door. The girls usually keep sunscreen, bug spray, and sunglasses in there now that it is warming up. If everything has a place, then we can put everything away in its place. It sure makes me happy when we're clutter-free and organized! What is your best tip for combatting clutter? Or what storage solution works well for you? Today is our little monkey's 8th birthday! Time sure has flown from the day she was born. We love you, baby girl!!!!!!!!!!!!!!!!!! You'll always be our baby no matter how big you get. Can you believe that my baby is going to be 8 tomorrow?!? Where has the time gone? My sweet, sweet baby is no longer a little girl. She's a spunky kid who lives life fully. For you CTMH fans, this layout is my take on the Stardust Workshop on the Go (AKA my kit of the month). We did this layout at last month's scrap class. I had actually planned on using the Daydream option (same layout, different papers), but then came across the photos on my storage binder. Stop the press! 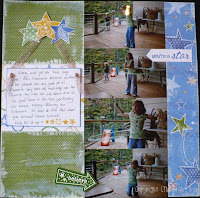 These photos were PERFECT with the Stardust papers, and since my scrap mess was still out, why not have at it? The technique focus of our class was the distressing kit, and I obviously had fun distressing the edges of my layout pieces with our Delta Ceramcoat paint. It dries quickly, and a light touch with a dry brush is all you need. Can you see how I painted directly on the small photo on the left page? For embellishments, I used the Stardust Flexi-Labels and some Chocolate organdy dot ribbon. Can you tell I love this girl? She's a star in my eyes no matter what, and she sure can hula hoop! Here's an Earth Day challenge for you! 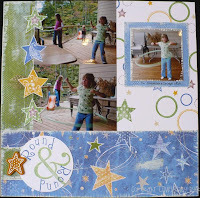 The challenge (here) was to use something recycled, or non-scrapbooking related, on a scrapbook layout. Here's another blog participating in the challenge. Why not give it a try? When you post your creation (scrapbook page, card, or other paper-crafted item), place a link to it in the comment section. I'll be picking a random winner for a little blog candy, so get busy! You have until next Wednesday to post your Earth Day creation. Today is Earth Day! What are you doing to celebrate and take care of our Earth today? What do you do every day? Please post a comment to give us all some ideas to help us take care of the only place we have to live. We are trying much harder to conserve electricity. My husband loves to turn out lights and remind us to "go green." We set our thermostat a little cooler in the winter and a little warmer when the air comes on. It doesn't hurt at all that these save us money too! I also like to recycle, but that can be difficult here in "Mayberry" since our recycling facilities are limited. We do what we can, and I'm a firm believer that every bit helps. This week is our dreaded CRCT week- Georgia's mandated student testing. It's especially stressful on those of us in 5th grade, because 5th graders must pass the reading and math portions (along w/their report cards) to be promoted to 6th grade. While I'm not worried about my girls' performance, I am worried about some of my students. We've worked hard this year to get them ready though. Poor Ansley was home sick today w/a fever. She's doing some better, so hopefully she can go to school tomorrow for the math portion and to make up the English sections she missed today. Macey is finished after the math section, but we have science & social studies Th. & Fri.
Ansley has made up some silly names for CRCT week, but our favorite is Torture Week. Bwahahahaha! Yesterday's Crop for a Cure was a huge success!!! First, I have to thank everyone who helped. There is no way I could have done this event without help!!! St. Clare's Episcopal Church let us use the fellowship hall, the St. Clare's Relay for Life team helped out and provided a delicious dinner, WACF 95.1 announced the event daily (how weird it was to hear my name on the RADIO!) and donated door prizes, the North Georgia News published my article about the benefit, our State Farm agent provided door prizes, and United Community Bank provided pens. My friends Joy, Carolyn and Nancy provided some silent auction items. I truly hope I haven't forgotten anybody! My Mom was a huge help!!!! Of course I have to thank DH and my MIL for taking care of the girls so that I could host this event. Here are several of our scrappers cropping their hearts out. They got to wear the crown when they completed a layout, so there was some serious crown-swapping going on. The ladies who didn't get to wear the crown shall remain anonymous (protecting the guilty and all, ya know), though they did work hard on their projects! The best news of all is that (so far) we have raised over $370 for the American Cancer Society!!!!!!!!!!!!!!! WOOHOO!!!!!!!!!!!!!!!!! In addition to our prizes last night, we have some more winners. Traci gets to pick out $60 in select Close To My Heart FREE products!!!!!! Sue U. gets a free Tickled Pink scrapbooking kit!!! Sue T. will have the option of purchasing an item at half price (and if she doesn't want to, I'll have my little helper choose another name from the basket). Thank you again for your generous support for such a worthy cause! Ansley went to 4-H DPA (District Project Achievement) yesterday with her presentation on pottery of the Cherokee Indians. We were very proud of her earning the opportunity to go! (She was the 2nd place girl in her class from CPA.) She said that there were about 15 kids in her category, and she came in 3rd place! Her friend Emily (whose birthday party she went to last night) won 1st, and a girl from another county won 2nd place. BFF Isabel won first place in her category, and I hear that my students who went did very well too. Way to go, kids! Getting up and giving a speech is one of many people's greatest fears, so you have all accomplished something most people would never do. I LOVE the color PINK. I'll admit it. I don't think there's a shade of pink that I don't like. Even if you're not a "girly girl" I bet you too will be tickled pink by Close To My Heart's National Scrapbooking Month promotional scrapbooking kit! Best of all, it's available for order TODAY, two weeks before National Scrapbooking Month begins. It includes everything you see in the three photos. Can you see the GLITTER on the two sheets of B&T in the last photo? How fun is that? For my loyal readers who aren't into the pink or the scrapbooking so much, I'll forgive you and not bore you with details. You can find them all on my CTMH website under my calendar for today's date. new Scrapbook and Share website to learn about how you can win some great prizes from CTMH!!! You'll be tickled pink! P.S. In conjunction w/my Relay for Life Crop for a Cure on Saturday, 20% of all orders will be donated to the American Cancer Society. You can help me help a great cause. Thanks! Thank you, Easter Bunny! Bok! Bok! Happy Easter from my family to yours! Today is indeed a most blessed day. Today is my mother-in-law's birthday, and we celebrated with her at the lovely (and delicious) Brasstown Valley Resort. Here you can (hopefully) see the girls giving her a Cherokee basket that we bought on our trip. JC thought it was very funny that a "Longaberger Lady" would give a basket of a different sort, but with BJ's Cherokee heritage and her efforts at educating others about Native peoples, we thought it was quite the thing. Happy birthday, BJ! We love you! We are back home from a busy camping trip in Pigeon Forge! We left in the rain, drove through the sleet and snow, found out how good our heater is, and all in all had a great time. I will post pictures tomorrow. Last Saturday was my Memory Box workshop. Participants received a My Creations Memory Keeper Box and a sheet of Fresh Shapes Dimensional Elements (chipboard) and had the option of adding on a 9"x9" My Creations Memory Showcase accordian album. My great customers graciously allowed me to take pictures of them with their gorgeous creations. Ann plans to finish hers with a few Just Blooms flowers in the center and will stamp "For everyday" on the tag. Joy plans to use her box to hold keepsakes from her daughter's wedding (though I hear she's changed the cover a bit). Can you see how she used pieces of a large pink Just Blooms flower to create butterfly wings? She used pieces of the Fresh Shapes Dimensional Elements to construct the butterfly body. Nancy (at right) stamped a design along the edges of her box. I love how she incorporated a tag from one of our classes last year into her box top! Can you tell that I sponged the Dimensional Elements frame and flourish in Sweet Leaf with my foam texture tool and then used the black stubble tool to add specks of Twilight? Also, I paper-pieced the monkeys but first stamping them on Chocolate textured cardstock that I lightly sanded first and then stamping them onto Colonial White cardstock. I ended up sponging a little Chocolate ink onto the Colonial White faces because they were too stark. Before I give her the box, I will adhere the two flaps shown in the last photo, but until I do it will lie flat. Snow showers are expected for today, so I am glad that I snapped these photos before the freezing cold! The first is the view from my living room window this time of year: the tulip magnolia in the foreground and the weeping cherry in the background both bloom in gorgeous shades of orchid. The girls and I have thoroughly enjoyed watching a pair of blue jays build a nest in the evergreen by our front door. They both perch often on the tulip tree on their way to or from their nest, with bits of building material in their beaks. Unfortunately they are too quick for me to capture with the camera! The second view is standing under the weeping cherry looking up into its frothy branches. The bees and eastern tiger swallowtail butterflies think it is a glorious haven. Enjoy this little glimpse of beauty. Take time to smell the flowers and to relish the simple pleasures in life. And we're off! The camper's packed, we have our coats and gloves, and we're headed north. What were we thinking? Seriously though, I'd rather be cold in the mountains than cold at the beach! I might have snow pictures to post when we return- and my family and friends back at home may also have snow pictures to share. Brr! The camper's almost packed for us to head out today. Too bad snow is expected tonight and tomorrow! Not exactly how we had planned to spend the break, but we'll have fun regardless. Yesterday my Mom and I went to the memorial service for my dear friend Traci's sister. (Traci and I have taught together for MANY years, and for the past 3 we have been co-teachers together in the same classroom.) It has been a long difficult month, but now Terry is in a much, much better place. As hard as it is to lose a loved one, it is some comfort to know that their suffering is over. My heart goes out to Traci and her family as they learn to live with this hole in their lives, and I pray that God will give them comfort and peace. May you scatter sunshine wherever you go! Normally I do not create 6"x6" cards because they require extra postage to mail, but I just had to play with my April World Puzzle stamp set to commemorate the new month. This card follows the "Simple & Sweet" sketch from Originals. I used Creme Brulee cardstock, ink, and ribbon, Hollyhock ink and ribbon, Blush ink, and some scraps from my Daydream paper pack. The sunshine stamp fit perfectly on the metal-rim tag. Happy April! The CTMH April stamp of the month, the World's Best Dad, has a playful fishing motif, making this set perfect for any man (or woman) who loves tossing out a line. Available April 1-30, 2009, only. Today is April Fool's Day (as if you didn't know that), but no, this isn't a prank on you. I haven't ever been big on this day and its pranks anyway. I can't wait to see what my school kiddos will try- we haven't been in school on this day for several years. Today only, Longaberger is offering a fantastic special on the wrought iron magazine rack- only $15 today ONLY (over 50%)! Check it out at my Longaberger site.